Shown (from left) are Mon Valley Nurses Association Vice President Dolores Stark, RN, of Charleroi; President Carolyn Manown, RN, of Belle Vernon; and Treasurer Virginia Saunders, RN, CRNA, of Belle Vernon; with Mary Lou Murt, MVH Senior Vice President of Nursing. The active and retired nurses of the Mon Valley Nurses Association continue to serve others, but this time the group helped local patients, donating $1,500 to Monongahela Valley Hospital for patient care items. Association officers absent from the photo are Secretary Carolyn Kmetz, RN, of Perryopolis, and Historian Sue Dunlop of Belle Vernon. Members made personal contributions for this specific effort to support patient care items such as portable blood pressure devices. The group was created by private-duty nurses in 1938 and today it has 56 active members, some of whom work at MVH. 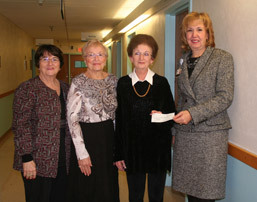 The group supports quality nursing care and nursing education, donates equipment and money to the hospital and funds one or more annual nursing scholarship. Since 1956, they have supported nearly 60 nurses with the scholarship. For more information about membership, contact Ms. Manown at 724-929-7273.